Full-Time Summer Employment Opportunities with the Dickinson College Farm! 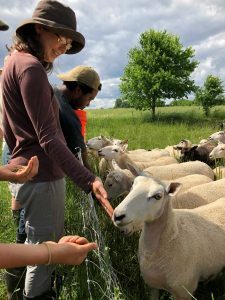 Students interested in gaining hands-on experience in sustainable agriculture are invited to submit an application for the upcoming summer season! Farm positions run from June until classes resume in the fall and include free housing, fresh organic vegetables and a competitive hourly pay. The College Farm seeks applicants who thrive in team work environments, are willing to push their own limits plus enjoy the outdoors and hard work. Applications are due to halpinj@dickinson.edu by March 4th, 2019.